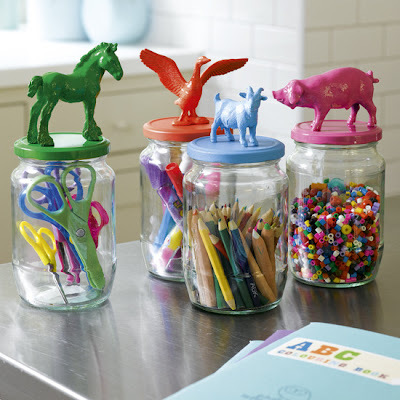 Hello crafty storage mavens! It’s Noelle stopping in today with a great idea for you. I do design work for a stamp company called The Cat’s Pajamas, and am lucky enough to get a nice discount on all the things I don’t get for free (thank you, sweet Alma!) and a few months back I purchased a whole LOT of beautiful Divine Twine in pretty colors. I love that stuff, I really do use it for a ton of things, and I love that I don’t worry about running out with the big spools. I just had it sitting on my shelf, though, and I wanted to hang it somewhere that I could access it a bit easier. One day, the proverbial light bulb went on, and I wondered if I could use mini tension rods in the train case to hang up my twine! I went to Bed Bath & Beyond with a stack of 20% coupons in hand (they really do have the most generous coupon policy I’ve ever seen, they take multiple coupons, expired coupons, etc. SO cool!) and I picked up several packs of these tiny rods and took them home. I was able to take off the end caps to slide on my twine spools, and….. Voila! Well, the more I thought on it, I figured there had to be other folks out there who had made some cool storage solutions with tension rods. They are cheap (particularly if you pick them up used! ), and come in a myriad of lengths! Sew Many Ways: Tension rods between table legs. Midwest Living: Easy Organizing Solutions for Every Room Beautiful storage for large papers and ribbons! You could also store large cuts of fabric this way! Yahoo Homes: 10 Ways to Store Kitchen Necessities I realize these are cutting boards, but wouldn’t this work just as well for Silhouette cutting mats, 12″ stacks of paper, or stamp sets? It’s Cicily with an amazing Craft Studio, Handcraft Your Life, from Lia Griffith. I found her blog and studio space while browsing on Pinterest. Once you see her amazing photography, you’ll see the inspiration for her talent and if you’re like me, you’ll spend oodles of time perusing her blog. This is the picture that caught my attention. I love so much about it and all together it’s amazing! I love all the work surfaces she has. Look behind the desk. She removed a door, added a hollow-core door and painted it with chalkboard paint. Oh and look up! Through the doorway is her office. I envy her all the natural light coming through her windows! Here’s some of her creative and decorative storage ideas. I hope you follow the links to check out Lia’s blog. You can see more of her office and studio on this tour here! Hey there, it’s Lisa here on this crisp November day! Have you ever purchased an item for your crafty endevors but never got around to using it? I know silly question right ~ we ALL do that!!! I have a jar of wooden spools that are about to be rescued. Today I’m sharing a variety of ways to use them as a storage solution. First up are these gorgeous shabby chic memo spools. 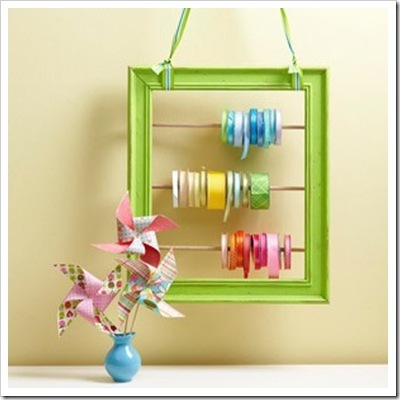 A great way to use up snippets of favorite ribbons or trims and a pretty place to store notes or ideas! Turning a spool into a sweet little pincushion keeps fancy pins and sewing needles close at hand. I see something like this in my future! A perfect way to store delicate or vintage trims can be seen at the Paper Doll Girl! Ready for a touch of happiness in a jar? Even a small spool can hold yard after yard of twine then be tucked neatly into a jar. Larger vintage spools that can be found on Etsy, Ebay or specialty stores work beautifully for buttons or wrapping twines as well as hemp cording and jute. I love the idea of pretty scissors placed in the spool ~ decorative and handy! 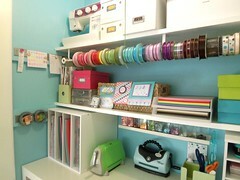 Altering one end of the spool to be removable is a cute way to store and color coordinate your Washi Tape collection. This is a delightful way to store ribbon! Neat, tidy and easily accessible! I’ve been inspire to put my neglected spools to good use I hope you have too! Don’t have any spools? Most stores such as Hobby Lobby, Michael’s and Joann carry them in large and small quantities. Archivers and other scrapbook stores usually stock Maya Road and Jenny Bowlin. And if you have a fondness for the vintage variety try Etsy, Ebay and antique stores they offer a great selection. Thanks so much for your visit, we appreciate it! One of the crafts I enjoy doing is embroidery. I typically do cross-stitch projects, but I love to do all types of embroidery. Even if you only occasionally do embroidery, you can very quickly acquire a large amount of floss. Organizing it so you can find the right color, keeping it tangle free, as well as keeping stock of how much you have on hand is a necessity. Following are some ideas of how to keep it neat and tidy. One of the most widely available and commonly used organizers for floss is the plastic divided bin and the plastic (or cardboard) cards that you wrap each individual floss on to. The boxes and cards are available at almost every craft store. You can either hand write on the corresponding floss number onto the card, or the starter kits usually come with stickers using numbers from popular DMC floss. Allison, from Little Lovelies, came up with a clever idea to get those cards wound up quickly! She rigged a bobbin winder onto her power drill and attached the card. So clever! Sometimes it may be easier to store the floss in it’s original numbered skein rather than transferring it to the cards. Storing the flosses by color in separate bins or boxes seems like the best way to be able to find what you need. If you don’t want to spend too much money, you can organize with items you may already have on hand. 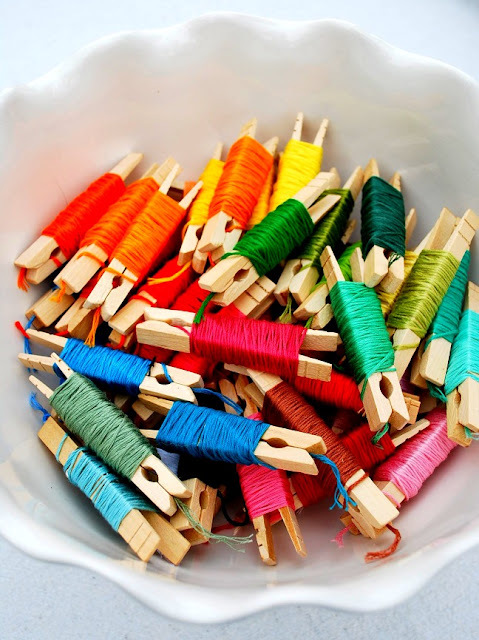 Clothespins keep the thread from unraveling and allow you to see what you have. You could also use small snack size ziploc bags and a binder ring. 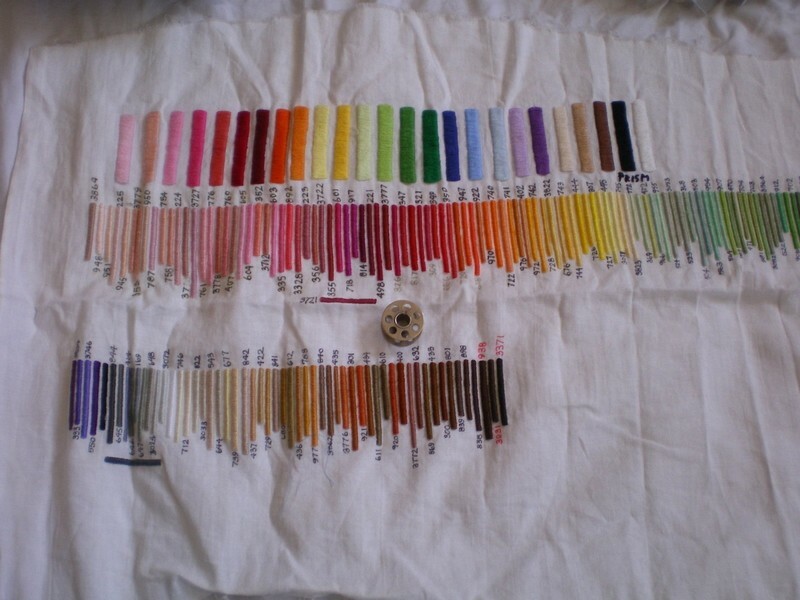 And if you want to be uber organized, you can create a color chart with all the threads you have. How do you store your embroidery floss? I’ve only got one image for you today. But one is all you need. Are your ready? See? I told you! For details about how that gorgeous herringbone background was created and how the crafty supplies, check out the full post on Lolly Jane! Check out this darling DIY project for storing spools of twine. I’ve been spying these adorable frames from Michael’s, but couldn’t decide on a project to use them on…until now! Happy Dance! Be sure to follow the link to the Damask Love blog for a complete tutorial on how to create on of your very own, for just $12 and some change! 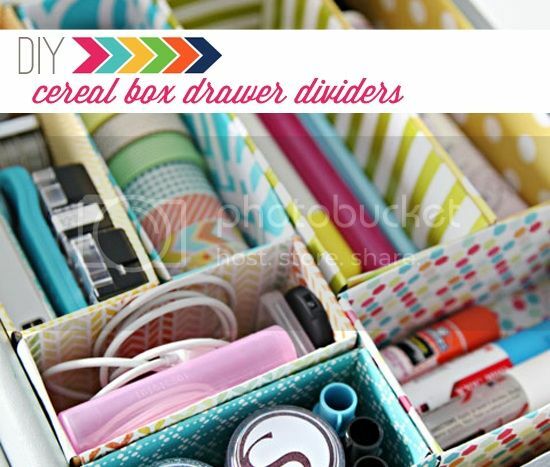 Another drawer storage idea, from Upcycle the Gift blog, uses cereal boxes cut and covered with patterned paper. Great modular storage with limitless possibilities! Hope these ideas inspire you to re-imagine your cast offs and put them to good use in your craft space! Hi there! My name is Noelle McAdams and I am really excited to be bringing you my first ever post for Craft Storage Ideas! Today’s post is about a ribbon re-do. After I show you how I reorganized and cleaned up my own ribbon mess, I’m going to show you some other pretty options for ribbon storage from around the web. Let’s get started! When Rebecca asked us what topic we’d like to tackle first, I knew IMMEDIATELY what I’d like to fix about my crafty space. My ribbon/twine/fibers were a MESS. I had about 8 different ribbon storage “systems” and places that it would land. I love ribbon, and have collected quite a bit of it through many years of crafting. Some on spools, some in plastic bags, some wrapped around little embroidery floss cards, some gathered up into little bundles and taped…. NONE of it easy to find or access, plus it was giving my small space a very messy vibe. Here’s a picture of it all spread out “before” for you. Space savvy. My room is tiny and I share it with my kids and a giant computer desk. Attractive. I wanted something that was nice to look at, aesthetics are really important to me. Easy to replicate. 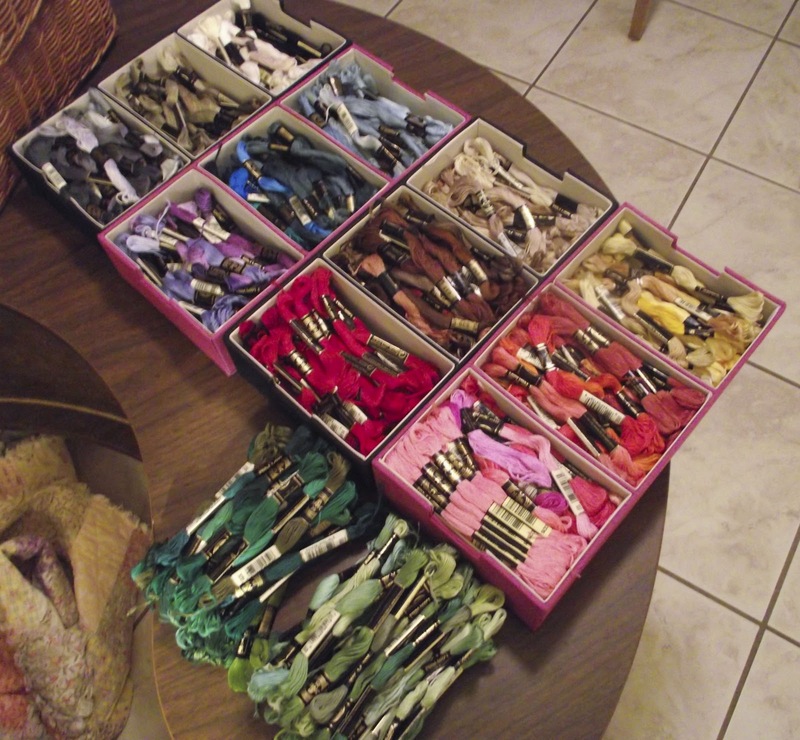 Just in *case* my ribbon stash keeps growing…. 😉 I didn’t want to buy 6 ribbon-specific boxes and then in 6 months not be able to get any more of the same ones. Or have one size of spool not happen to fit in the boxes. Affordable. Looking at all the money I had already spent on storage that wasn’t working, I didn’t want to waste another penny. I’d rather buy more ribbon! Easily accessible. I wanted to be able to find what I was looking for at a glance. While in the past I’d organized my ribbon based on sizes of spools, this time I wanted at least part of my system to be color coded, so I could find the shade I was looking for easily. These were my jumping off points for my new system. I am so happy with the way everything turned out, too. All the spools and large ribbons were stored on these multi-tiered closet hangers. Each “arm” on the hanger is hinged and swings out, so it will be easy to remove empty spools and add new ones. These were 5.99 a piece at my local Target store. You can find them in the closet section, near the regular hangers. I already have a hanging bar in my space, and there was extra room on it to add these, so it worked out beautifully! *A tip: If you have something you really want on a spool, but don’t have a spool that will fit it, use a toilet paper or paper towel roll instead. I did that with a few of my wider ribbons, and it worked beautifully. Plus, it was FREE! I was able to use the clothespins for several different types of material. Ribbon, fibers, and twine all worked extremely well with these! I don’t have any yarn, but it would work well with leftover yarn pieces, all you knitters and crochet junkies out there! Clothespins are cheap. I had some in my laundry room, but when I ran out, I paid only around 3$ for 150 clothespins. They are also very easy to find if I need more! I would say, who needs more than 150, but I know I might well need more someday! They take up very little room. I could have fit all these into one small bin, but I split it into two, simply so I could see things easier. I noticed that even though the first few wraps of the ribbon are around the squared off clothespin, very quickly the wrapping became round like a spool. I think I’ll have a lot less kinked up ribbon with this system. This was really fast and worked with all the bundles of ribbon, cards of ribbon, ribbon I’d bought in yardage that had no spool, etc. If it’s really bulky, you could always cut your length in two, and split it between two clothespins. I used this cute two tier metal container to hold my twine, fibers, and those teeny spools of ribbon that I just felt were too cute to unwrap! I had already been using this for ribbon, so it didn’t cost me anything. I have a lot of vintage pieces in my craft studio and even though this is not really vintage, I love the look of it. Really I didn’t get rid of much ribbon at all. It was consolidating it onto the small clothespins that made all the difference. I can’t believe how much space that saved! Plus, by hanging the spools instead of storing them in boxes and bins, I saved a LOT of precious “flat space” in my studio, and I can see it all much better to boot! Try a system that will grow with you as your storage needs change. I know that any more ribbon I buy will need to fit on these hanging organizers or be wrapped on clothespins. If I need to expand, I can always buy another closet organizer like this, or wrap more clothespins. This system is effective, affordable, attractive, and can grow with me as my needs change. I hope you like it too. But, if this isn’t the perfect system for you, here’s a few more photos that might help you figure out what will work best for you. 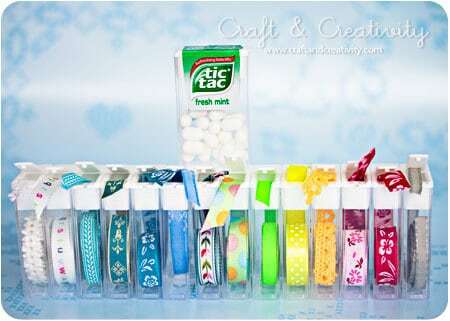 Isn’t this tic tac box one adorable? What could be better than turning your ribbon into art by framing it? Our friends over at PaperCrafter’s Corner are having a twine party and we want in on the fun! We’ve posted twine storage ideas before here, but one can never have too many ideas! Click any of the photos below to be taken to the original source & more info about that storage solution. What other ideas do you have to organize your baker’s twine? If you have some images to share, we’d love to see! Give us a shout at craftstorageideas@yahoo.com! Author Rebecca BoyerPosted on June 19, 2012 Categories Storage Solution Roundups!Tags Baker's Twine, studio, Twine2 Comments on It’s a Twine Party!